The former Florida governor and Republican presidential hopeful wished the president-elect success during remarks at Texas A&M University on Tuesday evening. COLLEGE STATION — Jeb Bush is still not a huge fan of Donald Trump — but he's hopeful. Bush, the former Florida governor whom Trump belittled — and thrashed at the polls — during the 2016 Republican presidential primaries, said Tuesday he has been impressed with the president-elect's appointments so far and believes a Trump presidency holds great potential. 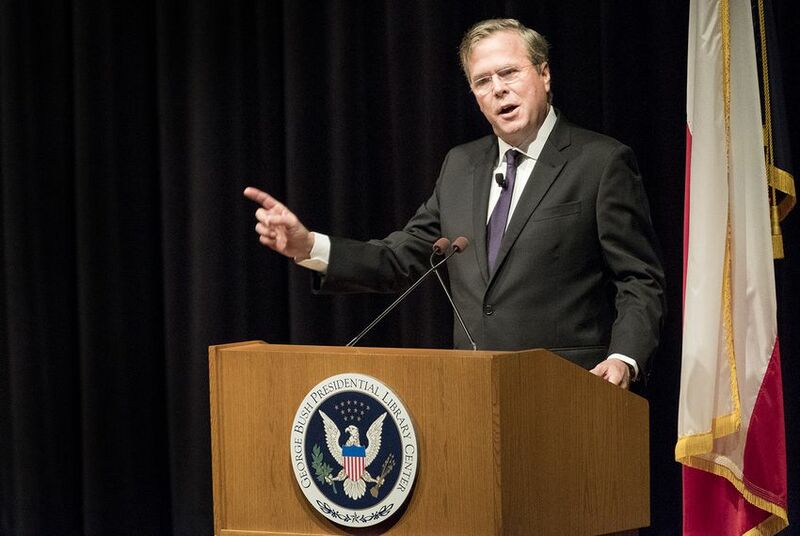 "He’s made some extraordinary choices, some really good choices, and we’ll see how it plays out," Bush said during an appearance at Texas A&M University, where he is teaching a short course this month. "If someone’s elected president, we pray for them and their families, and we hope for the best. We hope that he is successful because a successful president means we’ll have a successful country, and I sincerely believe that." Bush, responding to an audience question about his expectations for the next four years, noted there will be "lots of low-hanging fruit" for Trump to tackle when he takes office in 10 days. "If he gets off to the right start, people's spirits will be lifted," Bush said, noting "great anticipation" for Trump's presidency has been reflected in consumer expectations and public opinion. "If he delivers some big things to begin with, it'll be an extraordinary time." Yet Bush, who never endorsed Trump for president, still expressed some lingering reservations about Trump. He made clear he did not view the president-elect's provocative tweets as productive, joking that hopefully Trump's wife, Melania, "will steal his phone, at least have a rule — after six o'clock at night, no tweets or whatever." Bush also expressed unease with Trump's unusually cozy relationship with Russian President Vladimir Putin. Asked by an audience member if Putin is "smart," Bush replied, "Yeah — and he's not our friend." "He ran circles around our president, and he may run circles around our president-elect," Bush said. "But again, we have really good people making decisions with responsibility that quickly will get us to the proper position as it relates to Russia." Bush made the remarks after a speech on gubernatorial leadership and a Q&A with his son, Texas Land Commissioner George P. Bush. The younger Bush — the only prominent member of his family who had backed Trump for president — offered a somewhat sunnier outlook for the next four years, saying he was optimistic Trump would advance a "very pro-growth, aggressive agenda." Reflecting on the 2016 campaign, George P. Bush said that at least among Texas Republicans, the party is now "more united than ever." He had served as the Texas GOP's victory chairman, responsible for getting Republicans elected up and down the ballot across the state. Jeb Bush is currently teaching a 10-day course on gubernatorial leadership at the university's Bush School of Government and Public Service. The class runs through Monday. Tuesday night's crowd at the Annenberg Presidential Conference Center included Jeb Bush's parents, former President George H.W. Bush and wife Barbara. He briefly choked up while recognizing them at the beginning of his remarks. In November, Jeb Bush announced he was joining the Texas A&M University faculty to teach a short course in the university's public affairs school. In August, George P. Bush broke from his family in asking Texas Republicans to support Trump for president.